Copying large amounts of data in previous versions of Windows wasn’t always the best experience. Third party tools like TeraCopy are a better solution. 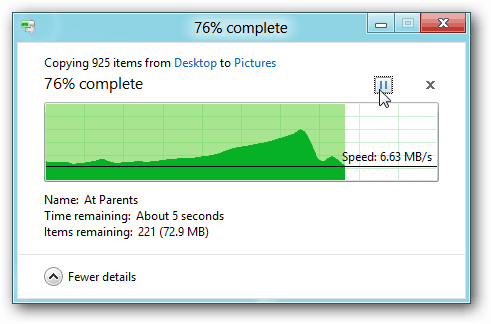 Now Windows 8 has a new file copying feature included by default. Windows 8 Consumer Preview is full of new features. One is the new file copy feature. It gives you graphical information about the copying process. And it lets you pause a transfer if you’re copying more than one file at a time. From the Metro Start screen, click Windows Explorer. Here I’m copying a file from a thumb drive to the desktop. Click More Details. A visual interface comes up showing information on what the copying process is doing. 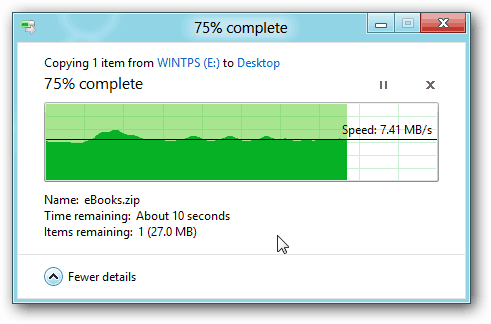 It shows the speed, the name of the file being copied and the percentage complete. If you’re copying more than one file, click the pause button if you want the other file to copy over first. Click the Pause button again to resume the process. The copy process works smarter too. 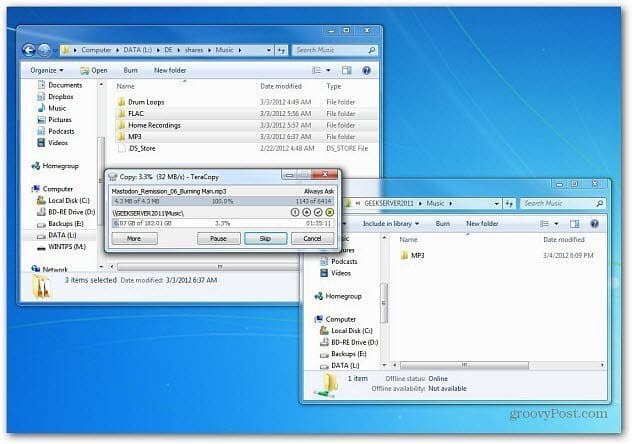 If you forget about copying a large file and power off your computer or close the screen on your laptop, it stops the copy process and resumes it once you power on the machine again. This is a welcome feature for users who transfer and copy large amounts of data between network and external drives. I am not sure if I will abandon my favorite copy utility TeraCopy yet, but this looks like a promising feature.